590 Marsh — Isaman design, Inc.
Residences, restaurants, and retail spaces converge at the corner of Marsh and Nipomo Streets to create an engaging mixed use experience at 590 Marsh Street. This project, along with the surrounding development, will be the new beacon of the San Luis Obispo downtown district. At the pedestrian level, community members are greeted by a number of restaurants and stores facing Marsh and Nipomo Streets. The corner restaurant, The Oak Room, is ideally outfitted with a large outdoor, covered dining room. Not unlike the existing Foster’s Freeze outdoor area, this new feature activates and enhances the street corner. By day, patrons can enjoy a cup of coffee and a pastry along with the ample morning sun. By night, this corner venue transforms into the place to wine and dine. Large sliding doors open the building to the covered patio, and the two-story residential “jewel box” glows above. This revived downtown corner glows with activity. Above the retail spaces, residential lofts enjoy unparalleled views of Cerro San Luis and the downtown core. A three level sky bridge connects The 590 with the new 570 building. The eclectic and warm pallet of materials engages with the existing downtown vernacular while offering a contemporary take. These materials include beige terra cotta cladding, warm gray smooth trowel stucco and stack bond brick. 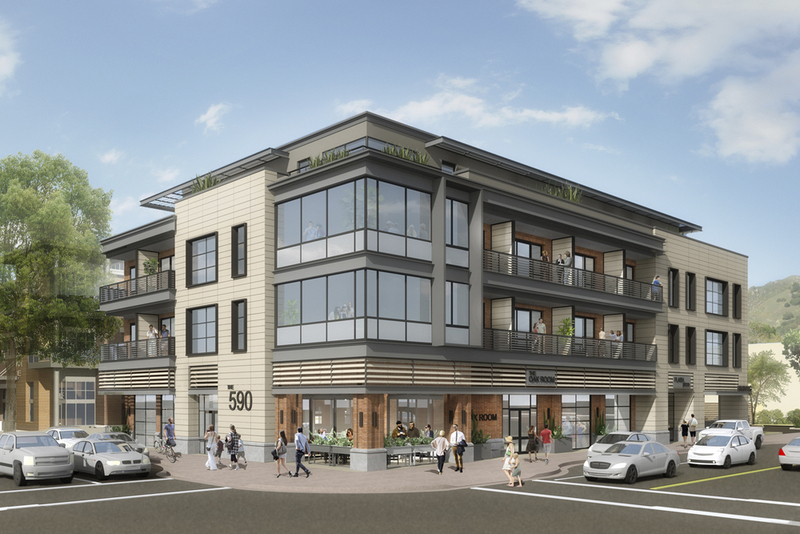 As the cornerstone of this new development, The 590 serves to revive an underutilized area of the downtown core while capturing the spirit of San Luis Obispo living.